Certificate: PG – Runtime: 114 mins. Mamma Mia! Here We Go Again is a jukebox musical romantic comedy film written and directed by Ol Parker. 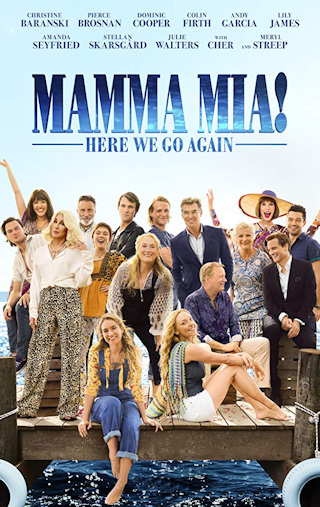 It is a follow-up to the 2008 film Mamma Mia!, which in turn is based on the musical of the same name using the music of ABBA. The film features an ensemble cast, including Lily James, Amanda Seyfried, Christine Baranski, Julie Walters, Pierce Brosnan, Andy García, Dominic Cooper, Colin Firth, Stellan Skarsgård, Jessica Keenan Wynn, Alexa Davies, Jeremy Irvine, Josh Dylan, Hugh Skinner, Cher, and Meryl Streep.